Thumbs Remover will search for Thumbs.db files in entire hard disks (internal or external), pen drives or in single folders and its subfolders; upon completion it will allow you to browse all Thumbs.db files that had been found and then choose whether or not to delete each one of them. 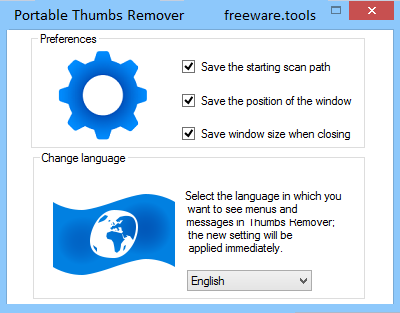 Thumb Remover can also enable or disable the Thumbs.db creation process in Windows XP, 8 and 8.1 for both local and remote folders (only for remote folders in Windows Vista and later), it supports integration within the context menu of Windows\File Explorer, when you right-click on a folder or drive. No installation is require to use this tool. Made as the portable twin of Thumbs Remover, this lightweight software application scans the computer to automatically identify Thumbs files (DB format) and delete them, since they are unnecessary items that just clutter the hard disk. It does not come equipped with complex features or configuration parameters, so it ca be handled by anyone with ease. Since installation is not a prerequisite, you can drop the program files in any part of the hard disk and just launch the executable. It is also possible to save Thumbs Remover to a pen drive or other mass storage device, in order to run it on any PC directly. An important aspect worth taking into consideration is that the Windows registry and Start menu do not get updated with new entries, and no extra files are created on the disk, thus leaving it clean after removal. The GUI is clean and intuitive. You can get started by selecting the folder or drive to scan, and click a button to start it. Results show the full path and size for each detected DB file. All you have to do is select files and click a button to delete them. As far as tool configuration is concerned, you can switch to another UI language and disable the tool from saving the starting scan path, position of the window and window size when closing, as well as extend the Windows themed frame borders. The tool runs on low CPU and RAM, so it does not affect the overall performance of the PC. Thumbs Remover does not hang, crash or pop up error messages. All in all, the tool gets the job done and can be easily used by anyone.